Tens of thousands rallied December 6 in downtown Caracas, Venezuela-after marching from Petarre, Catia, and other working-class neighborhoods-to mark five years of Chávez presidency and counter the drive by opposition coalition spearheaded by big business to oust the government through a referendum. A new showdown between working people on the one hand, and the capitalists on the other, is shaping up in Venezuela over the U.S.-backed drive by the countrys wealthy families to organize a referendum to bring down the government headed by President Hugo Chávez. 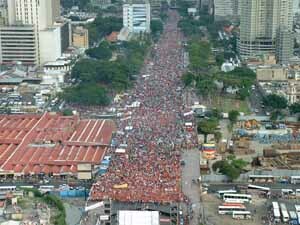 Tens of thousands of working people marched in downtown Caracas December 6 to celebrate the fifth anniversary of the election of Chávez to the presidency and oppose the latest attempt by the countrys capitalist class to force his government out of office. The demonstration took place four days after the pro-imperialist opposition completed a petitioning drive aimed at placing the recall referendum on the ballot early next year. There is no turning back on the road to the recall referendum, declared Antonio Ledezma, a spokesman for the opposition coalition Coordinadora Democrática, after petitioning ended the night of December 2. The opposition claimed it gathered 3.6 million signatures it plans to turn into the countrys National Elections Council (CEN) the second week of Decemberwell over the 2.4 million required to trigger a recall vote. The council has a month to review the signatures after they are filed. If it validates enough of them, the CEN is supposed to call a referendum the second quarter of next year on whether Chávez can remain president. In order to force Chávez out of office during such a referendum, more than the 3.7 million people who voted for him in 2000 must cast ballots demanding his ouster. Soon after petitioning started on November 28, the government accused the opposition of massive fraud. Evidence presented included testimony by workers who said their employers coerced them into signing the opposition petition with the threat of losing their jobs; forged signatures of people who have died; and thug attacks on pro-government observers at polling stations. The opposition assailed the measure as an attempt to prevent Venezuelans in Colombia from crossing the border to join the four-day anti-Chávez signature drive. After petitioning ended, the government said the opposition had come up short. They didnt even get 2 million signatures, Vice President Rangel said. The government also vowed to pursue through the National Elections Council a rigorous investigation of its charges that the opposition committed electoral fraud. Chávez is disrespecting millions of Venezuelans, countered Enrique Mendoza, the governor of Miranda state and a figure in the pro-imperialist opposition. Dont do any more tricks to avoid a process that the majority of Venezuelans want, Mendoza warned. Representatives of Washington and other capitalist governments who sent observers to back up the referendum effort were quick to side with the opposition. People have been able to sign, said César Gaviria, former president of Colombia and current secretary-general of the Organization of American States (OAS), and the process has been democratic and as far as our observers have been able to see, clean. Gaviria is heading the international monitoring mission. Spokespeople of the U.S.-based Carter Center, named after former U.S. president James Carter, joined in, saying they did not observe any irregularities. Representatives of a six-nation Group of Friends backing the referendum process also welcomed the signature drive as peaceful, according to Reuters. The six are the governments of Brazil, Chile, Mexico, Portugal, Spain, and the United States. After Chávez accused Gaviria of being biased in favor of the opposition, the OAS official met with the Venezuelan president. Gaviria said after the meeting that it is up to the CEN to probe the fraud accusations. We are sure the council will investigate fully and that when there is a result, all sides will accept it, the OAS secretary-general stated. On December 3, the day after petitioning centers shut down, the metropolitan police in Caracas attacked pro-Chávez street vendors and others with tear gas. The cops triggered the clashes by trying to seize illegal fireworks. The police accused the demonstrators of throwing firecrackers, and alleged the protesters had caused a riot. The metropolitan government of the countrys capital is run by Alfredo Peña, an opposition leader. It seems as though some people are trying to create disorder for some dark purposes, metropolitan police deputy director Orlando Gutierrez told Reuters. After opposition leader Mendoza stated that Coordinadora Democrática would not tolerate more tricks and maneuvers, Vice President Rangel questioned what the opposition would do if its bid to obtain a referendum failed. Will they have another go at a coup? he said. Rangel was referring to the April 2002 U.S.-backed military coup attempt, which failed to oust the president due to massive mobilizations by working people that caused divisions in the armed forces. A similar effort to topple the Chávez government through a bosses strike last December-January also faltered because of widespread resistance by workers and peasants. After these failures, opposition forces have refocused their efforts on organizing a referendum to recall the president. In response, the Fifth Republic Movement (MVR), Chávezs party, pushed for recall referendums against nearly 40 National Assembly deputies and other opposition politicians. During petitioning November 21-24, the MVR claimed to have collected more than enough signatures to place recall referendums against all these opposition figures on the ballot next year. Chávez has drawn the wrath of the U.S. government and its backers in Venezuela for taking measures that cut into the prerogatives of big capital, including an agrarian reform law and a bill strengthening state control over the countrys oil, gas, and other mineral resources that are part of Venezuelas national patrimony. The U.S. government has been irked by Chávezs public criticisms of the U.S.-led invasions and occupations of Afghanistan and Iraq. Washingtons hostility has also been fueled by closer economic and political ties between Venezuela and Cuba. These have included collaboration on the countrys nationwide literacy campaign launched last June and a program that has brought nearly 2,000 Cuban volunteer doctors operating free neighborhood clinics in many of the countrys poorest working-class neighborhoods. In another sign of this cooperation, well-known Cuban singer Silvio Rodríguez performed alongside Venezuelan artists during the December 6 pro-Chávez rally. On the way to downtown Caracas, thousands of protesters took over Altamira square for a time, and demanded the government prosecute former military officers and others who have taken part in previous attempts to topple the president. Former army officers dismissed for their role in the April 2002 coup and other opposition figures have been using the square for some time for anti-government protests. Working people, who have been the main obstacle to the designs of Washington and its backers in Venezuela to get rid of a president popular among the toilers, are mobilizing once again to push back the bosses latest plans. In addition to the December 6 march in Caracas, activities took place in Carabobo, Miranda, and other states to assail what protesters described as fraud in the opposition signature drive.